We’ve had so much fun at our summer camps the past few years, but this year will top them all and we are so excited! Our campers are going to enjoy 4 full weeks of arts, laughter, fun and learning! Art Projects, Field Trips, Guest Artist, Pizza Friday’s; all of this on top of our already amazing ACTING, DANCING, PAINTING AND COOKING classes! 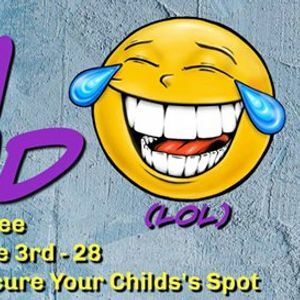 This year’s theme is "Laugh Out Loud (LOL)"
Students will learn all about various comedy styles (Farce, Slapstick, Parody, Satire, etc…) and comedic artist as we apply them to our lessons and activities! The summer fun culminates in a special performance on Friday, June 28th for family and friends where our campers will present an hilarious "Carol Burnett" / "In Living Color" style variety show! Right Now Camp is Open to RETURNING FAMILIES ONLY! So Hurry and Register Today!